Black solids Industrial grade spray Paint. Glossy Black High solids Industrial grade spray Paint. 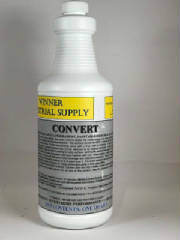 CONVERT Rust Converter can be sprayed,rolled and brushed on. It is the quick and convenient way to treat rusted surfaces. This product chemically converts the rust to an inert black polymer based coating that prevents future rust from forming. Eliminates the need for brushing, sandblasting or scraping before painting rusted surfaces. Once treated, surface may be left unpainted or may be painted for improved appearance and protection. May be used on all rusted surfaces. Allows for quick, mess-free application. Combines a unique fast drying carrier with special rust converting agents and a strong polymeric coating. 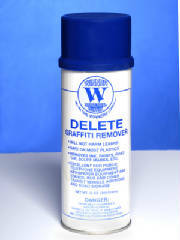 DELETE THICK GELLED FORMULA WILL QUICKLY AND SAFELY REMOVE PAINT,MAGIC MARKER ETC FROM METALS,BRICK, AND PLASTIC ETC. SAFE ON LEXAN AND MOST PLASTICS. DELETE IS A FAVORITE OF PORTA TOILET COMPANIES, CITIES AND SCHOOL DISTRICTS ALIKE! REMEMBER DON'T PAINT OVER IT DELETE IT. For MSDS click on details. KILZ® ORIGINAL Aerosol blocks most stains including water, smoke, tannin, ink, pencil, felt marker, grease and seals pet and smoke odors. Use on interior surfaces including drywall, plaster, paneling, wallpaper, wood, masonry, brick, painted metal and properly prepared glossy surfaces. 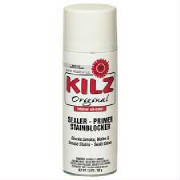 KILZ Original is not recommended on flooring unless used as a subcoat to new carpet or hard flooring. N.Y.C. MEA STANDARDS FOR LL26 SAFETY EVACUATION MARKINGS LAWS. MEA 451-05-M-2. KRYPTAGLOW SAFETY PAINTS have specially formulated a product that has achieved some of the highest brightness ratings for safety 4 times in laboratory tests. This paint was specifically designed for Egress systems. Sold as a complete system these are the first paints to pass with a combination of bottom coat and top coat for protection giving a lasting finish for years of performance. All are Water Base products for easy clean up and easy indoor instillation even in closed areas with poor ventilation such as stairwells. Kryptaglow products have been formulated to meet and exceed the new requirements for visible markings, using these new photoluminescent pigments to formulate one of the highest performing lines of safety paints available today. These paints have passed the MEA STANDARDS FOR N.Y.C. LL26 LAWS 4 times. Useful in many applications industrially as well as for evacuation routing. Imagine the possibilities. Krypataglow¨ is working on paints for almost every professional use. KRYPTAGLOW¨ PAINTS are designed to exceed all previous standards. Kryptaglow¨ is quickly becoming the leader in glow in the dark products. Kryptaglow Safety Paints for the future. Now! Add Clear Top Coat #1102. Follow specific MEA application Instructions required by LL26 Laws. KRYPTAGLOW MEA 1300 1300A 1300C Special Blend PAINT. For N.Y.C. LL26 Laws. Used for wall and floor application for Egress systems. Used in combination with our Kryptaglow White Base Coat #1171, and Kryptaglow Topcoat #1102 seals it for easy washability. Quick Drying. KRYPATAGLOW CLEAR WATERBASE TOP COAT #1102 Used for sealing our safety paints. It's specially formulated to absorb light and allow the fullest performance possible from Kryptaglow Safety Paints while giving a hard surface for durability. It's also Water Base for easy clean up. Dries quickly. KRYPTAGLOW WHITE Base Coat #1171 We have formulated a White Water Base bottom coat for use with our paint for MEA it's designed to seal any clean properly prepared surface for the best adherence of all Kryptaglow Safety paints. Works as a Primer and Sealer great for porous surfaces as well. Dries in about 1 Hour. Other products include Glow in the Dark MEA Certified Signs, Egress Stipping, and other safety products for your building. What does Material Equipment Acceptance or MEA Certified Mean?
" This standard is intended to provide minimum requirements for photoluminescent exit path markings that will aid in evacuation from buildings in the event of failure of both the power and back-up power to the lighting and illuminated exit signs. Photoluminescent material is charged by exposure to light and will emit luminance after the activating light source is unavailable. The markings covered by this standard are not designed to provide enough light to illuminate a dark egress path, but rather will provide luminescent signs and outlines of the egress path, stairs, handrails, and obstacles, so that occupants can discern these egress path elements in dark conditions. The markings are generally required to be located at a low location in case of smoke and to be readily seen, such as in a crowd situation. They are in addition to, and not as a substitute for, any other signage required under the Building Code, such as electrically illuminated exit signs with electrical back-up power required under § 27-383(a)". Extracted from NYC LL26 Regulations (pdf). MEA Certified Paints, Exit/Egress Signage, and Pathway Marking Strips are Available Now! Packaged in a case of 20 disks. Will glow for as many as 10 hours without additonal light source!